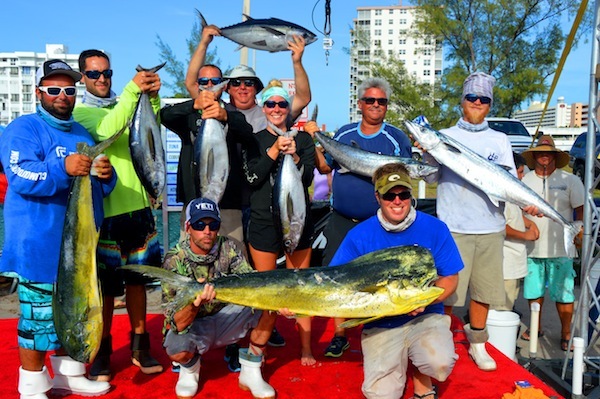 2015 marked a milestone for the Mercury/SeaVee Pompano Beach Saltwater Slam as tournament organizers, sponsors and participating teams celebrated the 20th Anniversary of the tournament. What started as a small community tournament operated out of a local tackle shop has evolved into a premier event that is part of one of the largest and most popular fishing series in the country! The celebration kicked off on Thursday, June 11th with live music, an amazing spread of food from Blue Moon Fish Company and hospitality bars from Miller’s Ale House that served up complementary drinks from Tito’s Handmade Vodka, Casamigos Tequila, Captain Morgan Rum and SweetWater beer. Many anglers participated in a corn hole contest during the kickoff to help raise money for the tournament’s charity, the Children’s Tumor Foundation. Team O-Sea-D showed the rest of the teams how it’s done by winning the contest. They were also gracious enough to donate their portion of the winnings back to the Children’s Tumor Foundation. On Saturday, June 13th at 7am, the real contest began as 92 boats hammered the throttles down in pursuit of their winning catch in the 20th anniversary of the Saltwater Slam. Team Get R Wet/Reel Addiction carved out a place for themselves in the Saltwater Slam record books with a tremendous catch and a 1st place victory in the Slam. After a long day of fishing, the team pulled up to the scales in their Mercury powered 39’ SeaVee and weighed in 2 kings, 4 tuna and 2 dolphin for a total of 152.7 pounds. One of the dolphin was a slob at 38.4 pounds and proved to be the heaviest dolphin and heaviest fish overall in the tournament. The team collected a total of $30,988 in winnings including Top Team, Heaviest Dolphin, Heaviest Overall Fish, 1st place in the Big 3, 1st in the Bluewater Bonanza and 1st in the Ante Up! The top team from the 2014 season of the PBSC, team Makin Time/Living Water, had a solid finish at the second stop in the 2015 series as well. They weighed in 4 kings and 4 tuna for a total of 133.8 pounds that netted them a 2nd Place finish and $7,970 in prize money. When they accepted their awards on the stage they generously donated back the $600 that they earned in the charity division in support of the Children’s Tumor Foundation! The top five spots in the Slam were rounded out with Off the Wall in 3rd with 89.9 pounds, followed by Conched Out in 4th with 87.2 pounds and Bionic Bait/Cache Money in 5th with 87.1 pounds. Heading into the championship leg of the series, Captain John Anderson and his Off the Wall crew are also sitting in 1st Place for the Simrad sponsored top team of the series award. The team that wins the series will receive a set of custom made rings and join an elite group of teams in the PBSC history books. Team Blue Moon/Shameless and Conched Out are right on the heels of Anderson’s team in 2nd and 3rd place. It will take a strong performance by the teams in contention in order to claim the rings and the #1 title for the Showdown Crown at the end of the season in August. Wahoo, tuna and dolphin were the 3 target species in the highly touted Pick 3 prize category for the Slam. There were a few boats that brought tuna and dolphin to the scales, but no team was successful in catching all 3. So, the $67,680 pot rolls over again into the Saltwater Showdown in August where it is expected to reach $80,000! There was no winner in the KDW Jackpot either, so it will roll over to the Showdown as well, with an anticipated payout of $20,000. 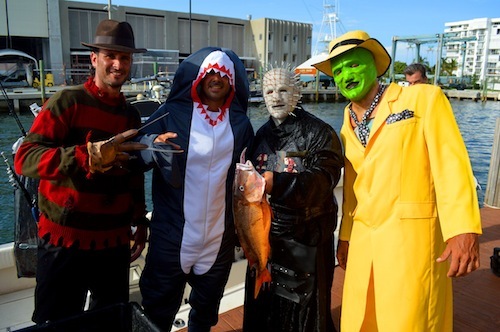 The most entertaining contest of the 20th Annual Saltwater Slam was inspired by tournament sponsor, SweetWater Brewing Company and their ‘Don’t Float the Mainstream’ costume contest! Many of the teams showed their spirit as they stepped on the stage in full costume at the weigh-in for the shot at earning a bonus $500 from SweetWater. There were a number of great costumes but it was the ‘villains’ from Hoo We Billin that stole the show when they stepped on stage representing iconic villains like Freddy Krueger, Hellraiser and The Mask. They even used a few of their fish as props! The Top Male Angler of the tournament was Steve Fishman from Makin Time/Living Water with 76.7 points. Top Female Angler went to Nikki White of O-Sea-D with 19.8 points. The Top Junior Angler was Hunter Irvine of Young Guns and Brandon Ingram of Reel Stubborn won top Pee Wee Angler. In addition, the Top Average Joe Team was Team Reel Line with 76.6 points. For full results of the Saltwater Slam visit https://www.bluewatermovements.com/slam_results/. The final leg of the series will take place August 6th– 9th. The highly anticipated Win a SeaVee Boat Giveaway will take place after the awards ceremony on August 9th at the Pompano Beach Civic Center. A Brand new 29’ SeaVee complete with twin 250 HP Mercury Optimax engines, T-Top & leaning post, trim tabs and a Loadmaster Trailer, a $132,000 value, will be awarded to a lucky winner. For information on how to enter this drawing visit www.winaseavee.com or call 954-725-4010. $60,000 Prize Category Up for Grabs in the Saltwater Slam!